My first visit to Olivia Cassivelaun Fancourt or more commonly known as OCF Singapore was back in 2014 on a food trail with restaurant week. I am back again at OCF Singapore to check out their new summer menu specially designed by Chef Jonathan to feature the seasonal produces. By the way, do note that this menu is only available from 11 July to 11 September 2016. The dinner menu at OCF Singapore is very simple. It only offers two set menus. 3-Course Gourmand Menu ($88) or 5-Course Prestige Menu ($158). The group of us decided to go for the 3-course gourmand menu, starting with the amuse bouche. 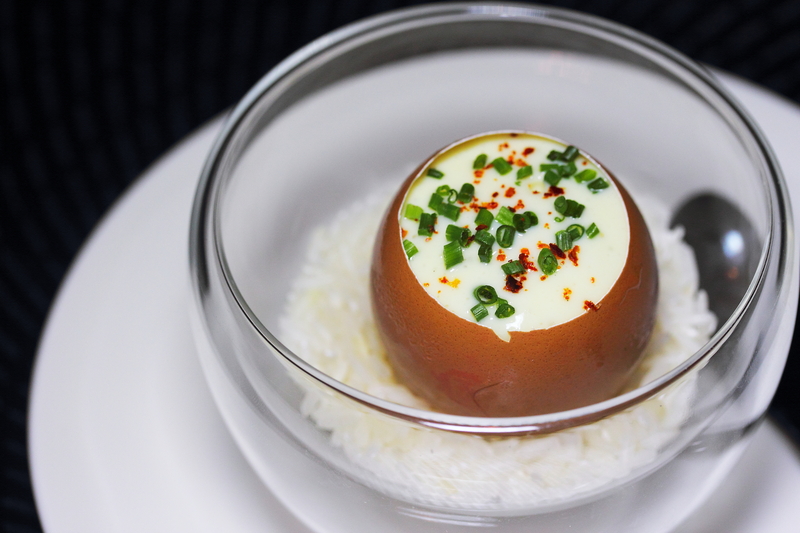 Served in an egg shell is a poached egg topped with some sort of egg foam perfumed with some Indian spices. There are 3 choices of starters on the gourmand menu. Since there was three of us, we just order one of each. I had the Les Coquilles Saint-Jacques (supplement $30) which is actually Hokkaido Scallop and Cauliflower puree with a touch of lemon and kristal caviar. 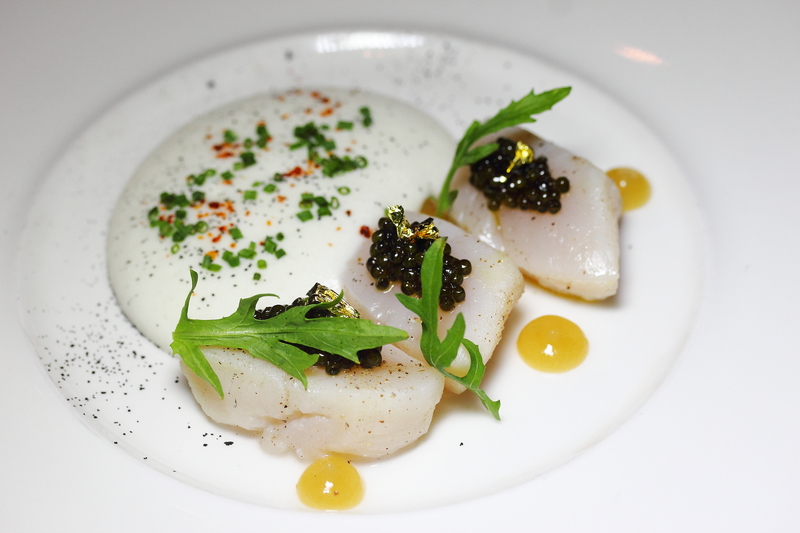 A clean dish on the palate focusing on the sweetness of the scallop complemented by the saltiness of caviar. The other two starters we tried are the La Pommes de Terre and La Tomate des Jardin Rabelais. The La Pommes de Terre showcases two textures of the agria potatoes. 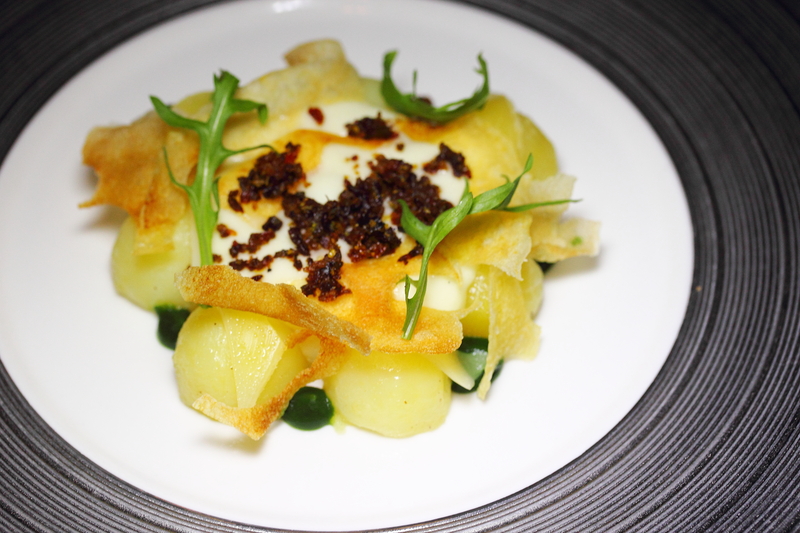 The butter and crumbly potatoes are accompanied by bacon spiced with aromatic vadouvan, watercress coulis, crisps and aged comte cheese. 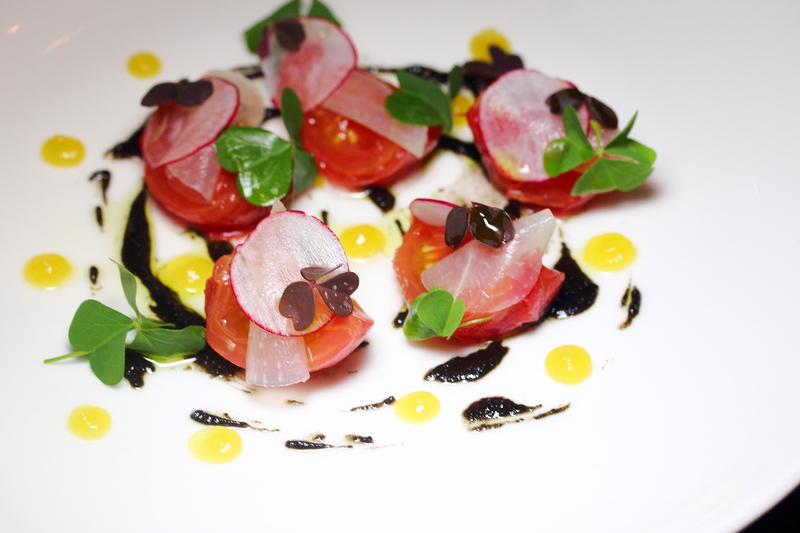 My favourite of the three starters is the La Tomate des Jardin Rabelais. The rabelais tomatoes poached in vanilla was so sweet, it was like having candy on a plate. I would highly recommend going for this. 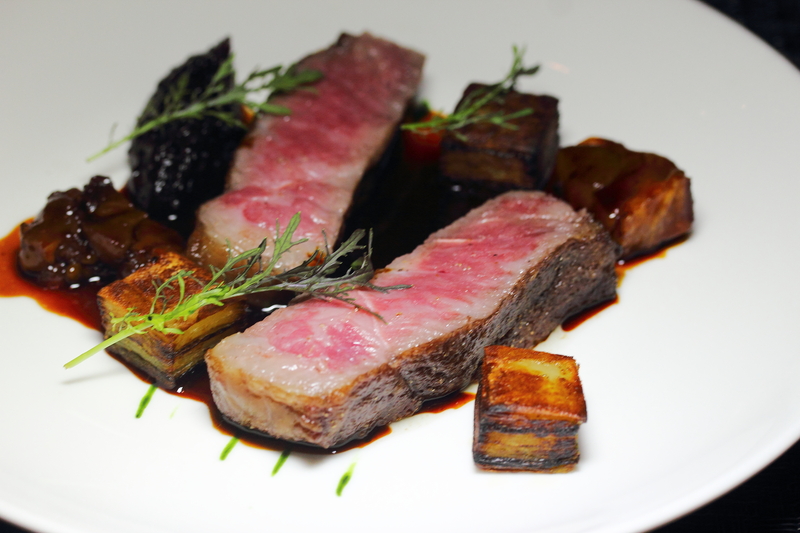 For the main, I had the Le Boeuf (supplement $70 - 150grams). 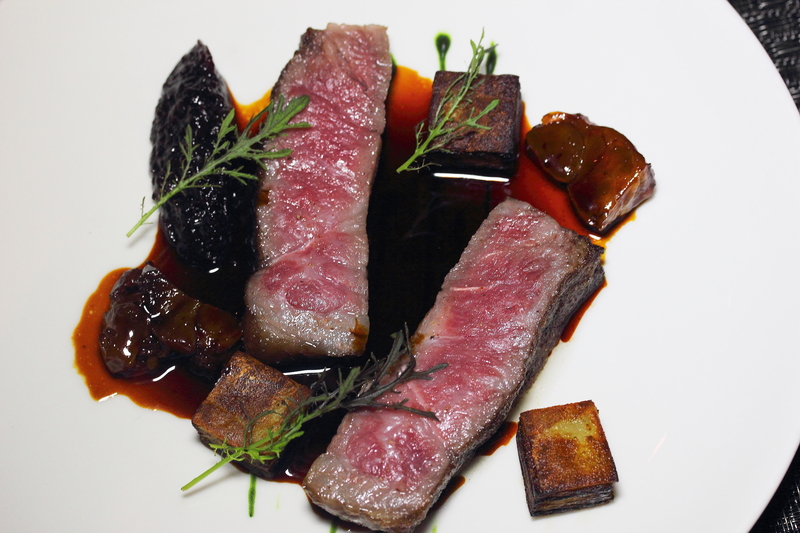 The Japanese Hida Striploin is cooked perfetly to medium, paired with braised cartilage and onion marmalade. I specially enjoyed the sweetness of the onion marmalade to cut through the richness on the plate. I thought the sauce was a bit heavy for the beef hence I ended up have the striploin on its own which is already so flavourful. For non meat lover, there is the La Legine. 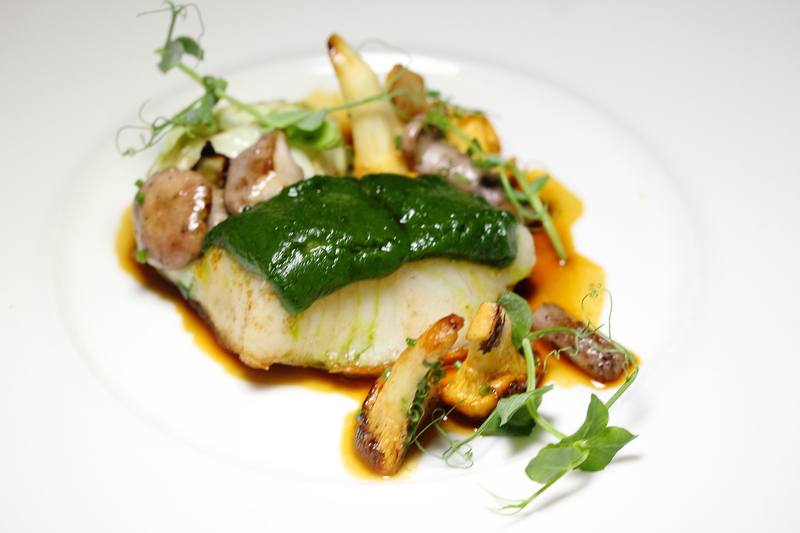 The herb-crusted patagonian toothfish is moist and buttery, accompanied with summer cabbage and wild mushrooms, dressed in a poultry jus. Nothing fancy but a smoothing experience cleaning up the plate. 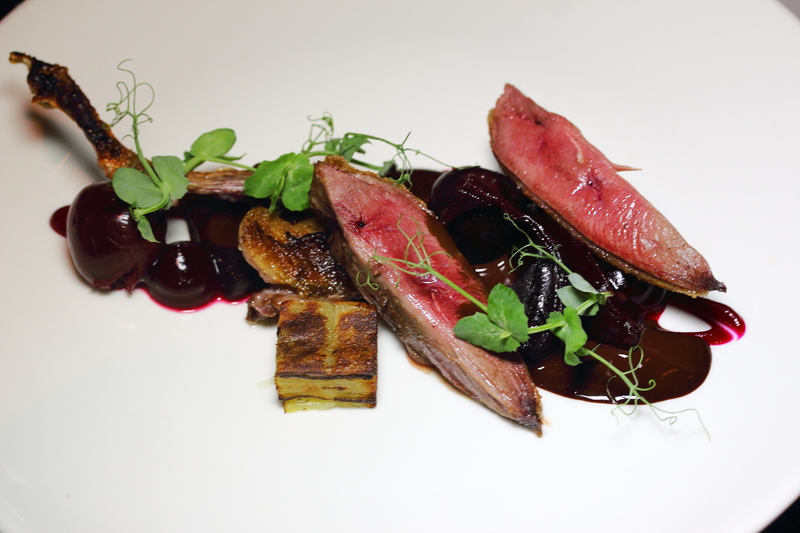 An acquire dish on the mains is the Le Pigeonneau d'Origine Francaise. I think the chef has got the doneness of the brittany pigeon spot on. The unique pairing of the bitter chocolate sauce, is new to me and it did work with the game. The pickled cherries also played an important supporting role to cut the gamy taste. 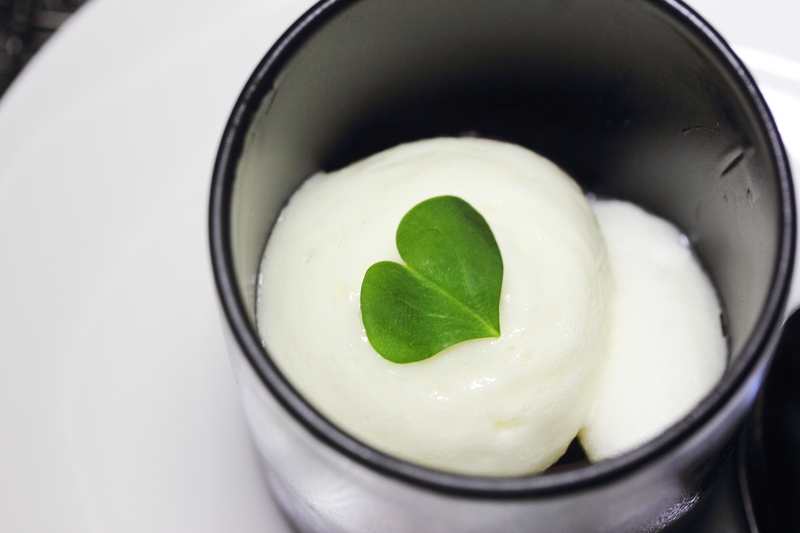 We were served Cucumber Sorbet with Compressed Grape as palate cleanser before moving to our dessert. The cucumber sorbet was light and very refreshing. All I know is I was craving for another scoop of it. Wrapping up the 3-course meal is the L'Abricote. 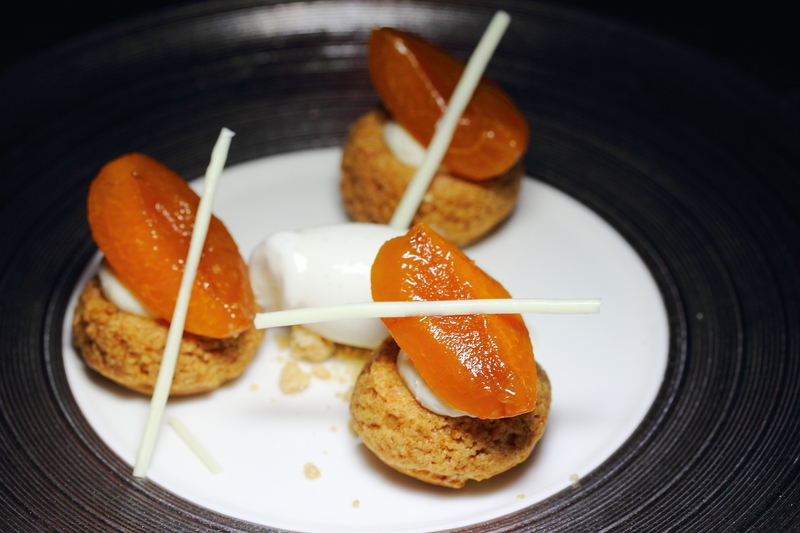 The choux puff pastry with earl grey mousse is topped with a spiced poached apricot from rousillon, served with a scoop of tahitian vanilla ice cream. The crispy and airy pastry completed a delightful culinary experience at the historical building which housed OCF Singapore.